Save Time and Save Money with our Aquarium Maintenance options. We have been in the business of maintaining aquariums for over 17 years and Art of Aquaria have been in Australia since September 2005. We offer a maintenance service for people that already have their own aquarium. We provide two types of maintenance services a one-off casual service and an ongoing service. The one-off service is $148.50 for the first hour and travel time and then an hourly rate or part thereof at $99 per hour. With this, we can also supply any goods or components required. The best option is the ongoing maintenance that allows us to manage the maintenance of your aquarium fully at a fixed fee so there are no surprises in your invoice. Peace of mind that your aquarium will always look stunning and fish will be Healthy and Happy. Frequency – Twice monthly service visits from your local dedicated technician. 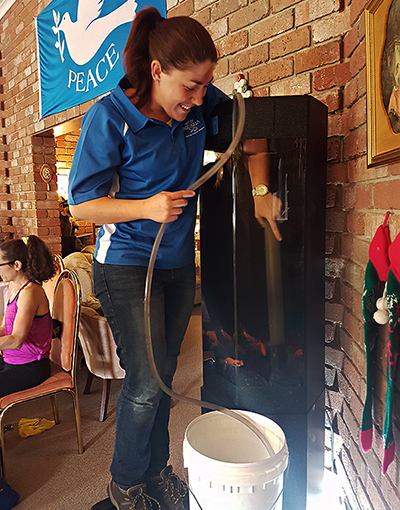 Cost – From $159.50 (including GST) per month for up to a 100 litre aquarium (larger aquariums have a higher fee). Stock – Replacement of fish, plants, fish food and a free callout service included. Downside – You will receive a monthly invoice and have no hands-on involvement of aquarium maintenance. Benefits – Regular water changes and servicing (twice monthly) ensure your fish are always healthy and Happy, having a regular technician to service your aquarium aids us in knowing your fish needs and your requirements for a stunning aquarium. Cost Benefits – A flat fee Maintenance program is often cheaper than infrequent (casual) servicing because at an infrequent service there is often significant cost for livestock (fish and plants) that have perished due to toxic water issues and significantly longer service time which is charged out. Therefore, you can have a stunning aquarium always or a dirty aquarium tidied up from time to time and our experience tells us it costs on average the same. Service Fee – $148.50 for the first hour, This includes travel & 1 hours service. $99 per extra hour or part thereof (Including GST). Stock – Any fish, plants, fish food etc. required (Additionally charged). Downside – you will need to do your own water changes and servicing in between our visits, costing can be higher if you have fish or plant replacement needs, callout charges will apply if you have an emergency (sick fish). Benefits – You have the ability to be involved in the upkeep and enjoyment of maintaining an aquarium.